This is a new product designed by me, Jason Savage. It’s essentially a small Frisbee type throwing device that can be folded and carried in your pocket. It’s made of 20 durometer silicone. Now you can be ready for some tossing fun and exercise anytime. You don’t have to carry a hard disk around. I named this flying ring after one of my favorite rescues – Tigra Tiger. The flyer’s curved surface is based on the heavy lift capacity Eppler 1233 airfoil. The fins produce drag or turbulence. The overall diameter is 6.5 inches. The center opening is 3.875 inches. Having a center opening reduces weight and offers more catching options. There are literally hundreds of different throwing disks on the market. This is the only one, to my knowledge, made of very soft silicone. The distinctive coloration is designed to remind throwers of the tiger. Imbossing on the underside features the foundation’s Web site URL. The Net Proceeds from sales will go to implement the Tiger Preservation Initiatives (TPI). I hope that incentive will encourage people to purchase Tigra’s Flyer™. 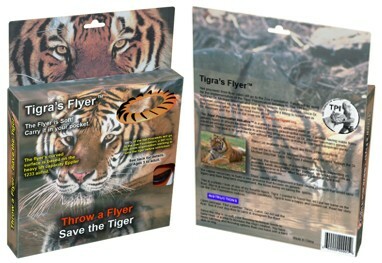 The distinctive packaging and the flyer itself are designed to focus attention on the tiger and its fight for survival. Our target market is the younger generation. Ultimately, if the tiger is going to survive, they will need to get involved with the efforts to save the species. This flyer is not yet available. I am putting together a crowd funding presentation to fund initial production. Crowd funding participants will receive an exclusive, commemorative certificate indicating they are the owners of the first flyer to be produced. Here is your opportunity to get a potentially valuable collectible. What if you had a first run Frisbee? Help me spread the word so I can get this product on the shelves. Tigers are running out of time! Before I launch this event I need to build awareness. Unfortunately, at the present time, I do not have a huge following on social media. Nor do I have a large mailing list. Getting a journalist to do a story on the tiger’s plight and this effort to save the species is a difficult proposition. I have tried to get media coverage about the tiger’s plight for years with limited success. Spreading the word about the event through social media stands a better chance. For that to be effective, I need your help. 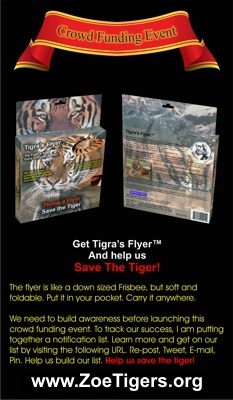 I am asking you to spread the word about this opportunity to get a Tigra’s Flyer™. There will be other unique perks available as well. Send your friends to this page and ask them to join our notification list. I will send out e-mail updates about the project. Get a flyer and help us save the tiger. Tweet it. Facebook it. Pin it. E-mail it. Help us build this notification list so we can have a successful event. Copy and use the graphic below for your posts, tweets, and other social media. Click the graphic to open a PDF file that you can print and post. A picture is still worth a thousand words. We can’t do it without you. Come on board! list for any reason except to keep you notified about this project.